Whether you rent or build new, refrigerated storage and freezer space is extremely costly, especially after factoring in the considerable amount of electricity needed for climate control inside a large warehouse. Whether your business is pharmaceuticals, food and beverage, logistics, or even climate-controlled archival storage, constructing or renting new refrigerated storage isn’t your only option for accommodating growth. A cost-effective alternative is rethinking the shelving you use in your cold storage facility and maximizing that pricey square footage in a whole new way. ActivRAC heavy-duty mobile racking is designed to withstand temperatures of -4 degrees Fahrenheit (F) and above, and for environments below -4 degrees Fahrenheit, we offer a stainless steel option. Both feature carriage and rail systems with shelving that moves side to side and eliminates static aisles—which means you’re able to use every available inch of your that refrigerated storage space that you’re already paying for. Value-Added Activities: Space created from mobile racking allows for value-added services like repacking, customization, and consolidations. Inventory Control and Compliance: Increased selectivity offered by mobile storage results in better inventory control and regulatory compliance. Increased Capacity: Mobile racking provides optimum visibility to items, making it easier to handle mixed-product pallets and smaller batches. 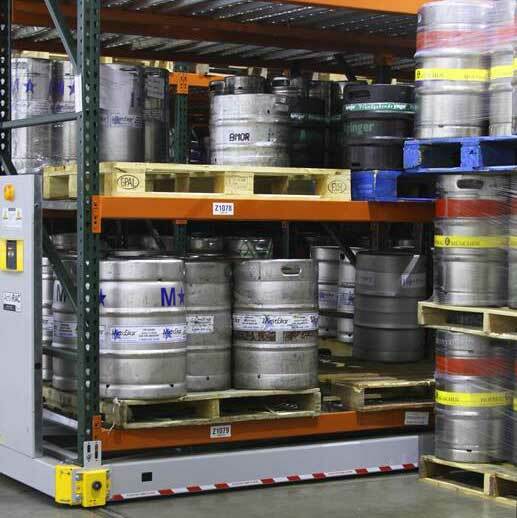 Reduced Energy Costs: Heavy-duty mobile racking can help pack a cooler more densely, lowering costs per pallet and energy costs. Improved Productivity: 100% accessibility to products, coupled with a compacted space, eliminates long travel times and unnecessary product touches.